Hello friends! As you all know a cute and very interesting challenge is hosted by our friend Divya Pramil from You too can cook. Challenge is the teams are divided on India's geographical location and put in North and South zone accordingly. One member of North team challenges the South team to try out the dish and same South team challenges North team. Its a monthly event and last month October challenge for North team was to make Mysore pak and for South team to make bhelpoori. Needless to say it was fun and enjoyable learning experience. This month challenge from South is from Yashodha and its Adirasam. Its a traditional South Indian sweet comprising of Rice flour, jaggery and water and deep fried. 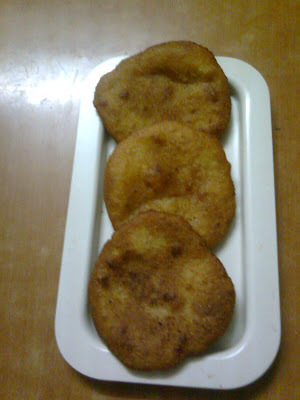 Since I am from North team I have to prepare Adirasam and when I saw the recipe at yashoda's place I was foxed. 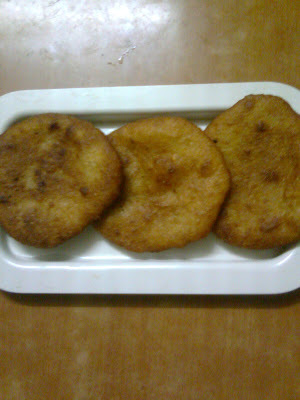 I am bit confused when it comes to making any sweet which requires sugar or jaggery consistency and my first impression told me its hard dish to make. Not the one to give up I bugged every member of South team and they were so sweet in explaining me how to do it that I started getting clear picture in my head. Since I have never tasted adirasam I decided to go with lesser quantity than what yashodha in her recipe wrote but I think measurements may vary for rice and jaggery. Soak rice for 1 or 2 hours and then drain completely. Here I spread the rice on newspaper to just dry a bit more but it should remain slightly moist. Grind the rice into a powder which is slightly more than rawa consistency. Thats how I understood it to be though I did goof up a bit there. It should not be very fine nor very coarse. Make sure rice particles are not there. Keep it aside. Add jaggery and water in a heavy bottom vessel and let it boil till all jaggery melts. Add cardamom powder here or grind whole cardamom along with rice. Jaggery syrup should be thicker of one string consistency. How to check the consistency,please refer to yashodha's post on same. Remove syrup from gas and after few minutes using wooden spatula slowly add rice flour and mix continously. Mix till you get smooth dough. You may not need all the flour but keep extra just in case. Again consistency should be of chapati dough. Keep the dough covered for a day and next day on a plastic sheet rub slight ghee and put lemon sized ball of the dough. With fingers slightly press and form a thick circle. Don't make it too thin and then fry cute little adirasams in oil. Fry on low to medium heat till both sides are done and remove on kitchen paper to drain out excess oil. So there I am done with it and by the way adirasams are very tasty and the look on my maid's face was worth watching as she was amused by my attempts to make this delightful dish. She was my tester for this as I have never tasted so did not know how it would be. Hope I did as per my South team members expectations and over to you for lovely comments. Heard that making adhirasam is so difficult. Without having tasted it, you have prepared it well.. Great job!! I have been thinking of making this for the last few days. The fried kind of sweets are not too popular in my house, so hesitating. 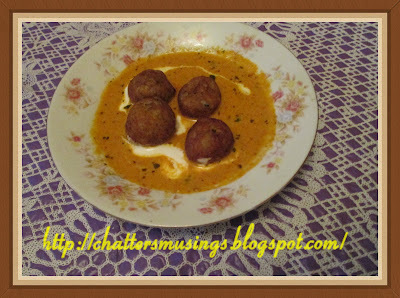 But Meena, this looks really good, so going to give it a try soon. following u thru SNC .. Adhirasam is difficult recipe. You nailed it !! :) Well prepared... Looking so tasty !! Hi welcome. ya well it is difficult but i had fun so just made a joke of my attempts. You did great job, adhirasam looks exactly same as it should be . yes swathi thanks ya looks wise they came out good. 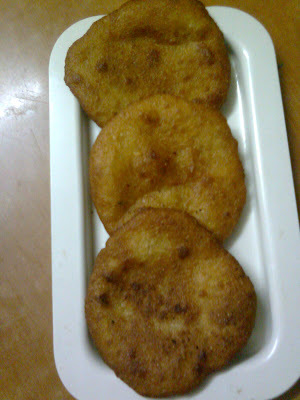 Adhirasam seems a difficult recipe Meena, but yours has turned out really well. Great going! Keep up the good work! Perfectly done, Meena. This one is difficult recipe but you prepared well. aunty , you made perfect adhirasams. previously , you hesitated to make . Aunty it is perfect and looking delicious than mine. Wow.. Super aunty without tasting that you have done a good job!! Love you aunty!!! Thanks for linking up to my event !! Just now noted that you have attached to my own event too !! Thanks aunty!!! adhirasam looks perfect dear... u have done a gr8 job at first attempt... Great Chef!!! Great job Meena, even its quite a hard task to get the exact texture,yours looking fabulous..You rock. Well acquired challenge meena :) Good job.. those adirasam looks nice and chubby.. keep going..
perfectly done meena aunty...this we make it for pongal usully..
Well done n great job Meena:) Looks perfect!!! great job meena anuty :) adhirasam looks really yummy n they are perfect :)..